By Nive Sharat Chandran fromYWCA of New Zealand. Nive is currently attending the 58th session of the Commission on the Status of Women in New York. As a young woman, I know from my vast experience working in communities across Aotearoa/New Zealand that young women play a vital role in building communities and nations. Therefore, I strongly feel that it is important that in the post 2015 framework we recognise that young women are different from young men and that the one size fits all approach undermines efforts to effect change and recognise diversity. Only when we recognise the vital role of young women will we be able to achieve gender justice in the Post-2015 agenda. In order to recognise the important role young women play in the world, the World YWCA conducted a survey asking young women from across the globe what is the future we want. This survey has produced one of the core priorities of the YWCA movement is call to action document titled “Her Future”. During, this year’s Commission on the Status of Women which is currently taking place in New York, USA I have the opportunity to represent the World YWCA as a short- term advocacy intern. 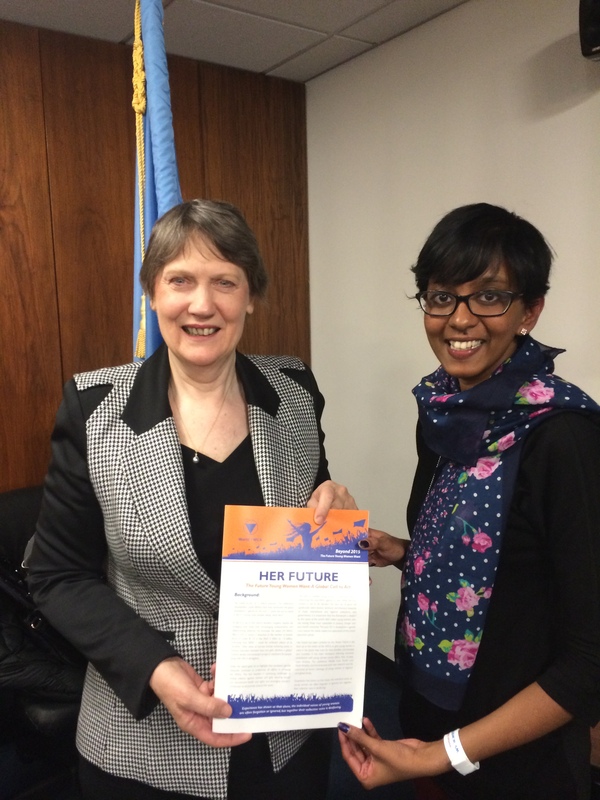 Part of my role is to promote “Her Future” and ensure that young women and girls are central to the post 2015 agenda. In a meeting with the UN Development Programme Agency I personally handed Helen Clark, Head of UN Development Programme and former prime minister of New Zealand, a copy of “Her Future”. Helen Clark is one of my SHERO’s! The World YWCA, actively engages and consults with young women and gives opportunities for leadership. For example, majority of our boards across the globe have young women on them, being a part of the decision-making processes and ensuring there is a strong youth focus in everything we do. While I have been talking about the importance of young women, I have to acknowledge the importance of women of all ages in progressing gender equality and justice. I recognise that women of all ages bring in wisdom and insights that can influence and shape a young women’s choices. Therefore I also believe in a model of intergenerational leadership and dialogue and feel that it is essential in achieving gender justice. Another key issue facing young women is violence against women and girls which is a global issue and therefore should form a core priority of the post-2015 agenda. This is an issue that is very close to my heart, having worked in an NGO called Shakti in New Zealand, we continue to deal with a lot of violence against women especially among the marginalised communities that are migrants and refugees. These communities tend to use culture and often religion as an excuse for the abuse and violence towards women and girls. But no scripture or religious text in my opinion condones oppression and violence towards women. I am a strong believer in promoting dialogue to change social norms and attitudes, which perpetuates these practices. One of core issues that I am passionate about ending within my generation is early and forced marriage with occurs in both developed and developing countries. Early and forced marriage is a human rights issue. This practice entrenches gender equalities, and undermines the right of the girl or young woman to fully and freely participate in decisions affecting them. It also prevents them from living in a world free from all forms of discrimination, coercion, stigma and violence. Often these young women or girls are exploited into slavery and servitude. This harmful practice also undermines their right to education, health – including sexual and reproductive health and rights. Therefore in order to achieve the future that young women like myself want, our vision for the post-2015 agenda reflects their call for action. In the Post-2015 agenda, we want the human rights based framework to be the core of agenda. This framework also needs to be embedded in all international, national and regional frameworks. We want to retain the gender equality as a primary goal within the new agenda as well as to mainstream gender across all goals and targets. This will ensure gender equality and justice. We also strongly want the Post-2015 agenda to be accountable in terms of having effective monitoring, and evaluation of future goals and targets that strengthens national ownership. As well as, promotes partnerships among governments, civil society and private sector. We need to ensure the voices of 860 million young women are counted in the Post-2015 agenda!